Strength training loads during a periodised programme are widely determined based off a specific percentage of an individual’s one rep max (1RM, the heaviest weight you can lift for 1 rep) . Certain percentages generally translate to certain adaptations e.g. >85% 1RM for strength adaptations, 70-85% for power, 67-85% for hypertrophy and <67% for muscular endurance . However, this system is potentially flawed, as an individual’s 1RM can possibly be limited by atypical performances brought on through factors such as fatigue . 1RM based guidelines also do not consider the variation in human performance because of biological and physical factors such as sleep, stress and nutrition, that impact performance during a training session or test . Neither does it consider an individual’s rate or performance adaptation or recovery . Therefore, if a 1RM is determined based off an abnormal performance, the prescribed loads could result in inadequate training prescription, effectively leading to sub-optimal training adaptations [3, 1]. What Is RPE And How Does RPE Work? Using rate of perceived exertion (RPE) is a form of autoregulation (AR). Autoregulation is a term used for altering ones training based on how you feel. AR considers such variation in an athlete’s ability and prescribes loads determined by an individual’s feedback, recent performance and can potentially ensure sustained adaptations are achieved . The most practical way to apply AR through monitoring daily performance and adjusting training load is by RPE . Original RPE scales range from 6-20 or 1-10 and have shown to be a valid measurement of intensity during aerobic exercise [1, 4]. Current research suggests that utilising the newly-found Repetition in Reserve (RIR/RPE) scales post exercise set, daily or weekly session, can be a valid way to prescribe loads for resistance training [1, 5, 6, 7). 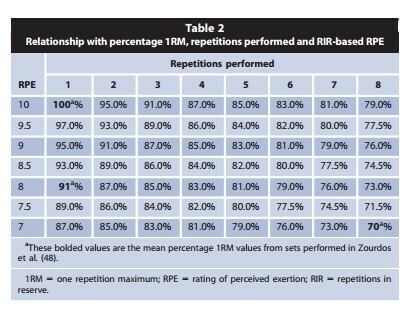 RIR-RPE is a potentially advantageous method of assessing trainings loads as an RPE for each given set during a training session is prescribed based off the number of reps left in the tank, eg RPE 8 is two reps left, RPE 9 is 1 rep left and RPE10 is maximal effort (refer to table 1) . Relationship Between RPE And Velocity. A study was conducted involving 29 college students, that aimed to compare RPE ratings based on RIR, at 60-100% of an individual’s 1RM back squat, during a strength training session . This was to determine if a relationship existed between RIR-RPE and average velocity, in order to indicate if the method was a valid measure of intensity. It was hypothesised that RIR-RPE could effectively quantify intensities as a higher RPE will yield a lower velocity due to the force velocity relationship, which indicates as force production increases velocity (speed) decreases . A similar study aimed to compare RIR-RPE and average velocity in competitive male and female powerlifters during the squat, bench press and deadlift during a 1RM attempt . 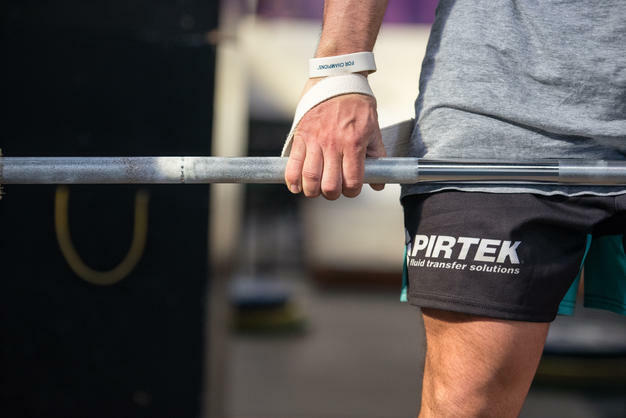 The studied hypothesised that RPE would effectively measure intensity across all three lifts and that as RPE increased, average velocity would decrease . Both studies identified a strong inverse relationship between velocity and RPE (refer to table 2) at various intensities, in which as RPE increased, velocity decreased [1,4]. One study further highlighted that there was a very strong relationship between actual 1RM and RPE across the squat, bench press and deadlift, with mean RPEs at 1RM being almost identical . These combine results identified that the inverse RPE-velocity relationship indicates that the method is a valid measure of training load and that it can be utilised across various exercises and intensities [1, 4]. RPE For Novice & Experienced Lifters. Studies have also analysed the usage of RPE by novice and experience lifters during the back squat . One of which found that experienced lifters produced slower average velocities and higher RPE’s at 100% 1RM than less experienced lifters . Only 14% of the novice lifters could effectively gauge their exertion at RPE10 during a 1RM, with the average recording at 9, in comparison to the 66.7% of experienced lifters that recorded RPE 10 at a 1RM back squat, with an average of 9.8 . This is due to experience lifters having higher motor unit recruitment and the inability of inexperienced lifters to effectively utilise training with moderately high to maximum intensities . This suggests that novice lifters potentially are incapable to effectively gauge RPE during maximal resistance training and may be unable to select appropriate intensities to stimulate the desired performance adaptations [1, 5]. RIR-RPE is an effective and practical way to apply autoregulation to your training. RPE considers variation in an athlete’s ability and prescribes loads determined by recent performance, an individual’s feedback post each set and can potentially ensure sustained adaptations are achieved [1,3,4]. However, utilisation of the RPE scale should not be incorporated into an athletes or individuals programming until they are experienced with resistance training and have a thorough understanding of the scale itself . Once these criteria’s have been meet, intensities should initially be prescribed based off a previous 1RM, with an additional RIR or RPE value accompanied. For example, you may prescribe 4 sets of 10 reps at 65-70% 1RM at RPE 8-9 (1-2 reps in reserve), giving the athlete a weight to aim for, while still determining the specific load based off individual needs . Following a period of this combined approach, the load may be prescribed based off RPE alone, for example 4 sets of 10 reps at RPE 8-9, in which the athlete is free to auto-regulate his or her intensity . Additionally, the inverse relationship between velocity and RPE provides evidence that RIR-RPE can be used as a valid measure of determining load to provide stimuli for a range or performance adaptations such as muscular hypertrophy, muscular endurance, maximal strength and power (refer to table 3) . The set and rep guidelines follow those previously described in the industry, however a RPE value is given in replace of %1RM [2,3]. An individual wishing to stimulate muscle hypertrophy should be prescribed intensities based of an RPE of 8-10, while utilising a 6-12 rep range . RPE of 10 should not be reached during an exercise in which training failure may can inhibit total volume on prior sets, for example doing a set on bench press to failure, followed by DB chest press . An individual aiming to increase muscular endurance should utilise sets with a minimum of 12 repetitions per set at 9-10 RPE with rest periods less than 2minutes . The precise rep range and rest periods should be specific to the athlete’s needs . Current recommendations suggest that for the development of strength, load intensities between 80-100% 1RM or 1-6RM, provide the greatest stimulus to increase maximal strength. Furthermore, due to specificity, an individual aiming to increase maximal strength should be familiar with some training at RPE 10, especially during a cycle in which the end goal is 1RM or RM test . However, training at intensities greater than 90% 1RM for a prolonged period, is shown to compromise strength at the same given volume at a moderate intensity. Therefore, when programming for strength, there should be a combination of rep ranges 1-6 reps and RPE values between 7-10 . For example, an athlete may do a set of 3 Reps at RPE7, 4 Reps at RPE 8, 5 Reps at RPE 9 and maximal set of 6 reps at RPE 10, allowing them to be familiar with maximal effort training, yet while still utilising a moderate intensity . The RIR-RPE scale can be further utilised to develop power among athletes. Force-dominant power training utilises relatively heavy loads with maximal speed to increase the high-force end of the force-velocity spectrum . Therefore, a RPE approach to intensity, would utilise low repetition sets, 1-5 reps, at a RPE of 6-8 with approximately 3-5mins rest between sets. Athletes should perform each rep with the intent of maximal acceleration throughout the range of motion . In conclusion RIR-RPE is a great method of prescribing training loads for a variety of performance adaptations that allow for the daily fluctuations in an athlete’s physical and biological factors. The scale can effectively be utilised in conjunction with a % of 1RM or as a sole basis of determining load. However, for the scale to be effective, when prescribing a training load based off a RPE, the individual should have a thorough understanding of the scale itself and be familiar with resistance training. Zourdos, M. C., Klemp, A., Dolan, C., Quiles, J. M., Schau, K. A., Jo, E., … & Blanco, R. (2016). Novel Resistance Training–Specific Rating of Perceived Exertion Scale Measuring Repetitions in Reserve. The Journal of Strength & Conditioning Research, 30(1), 267-275. Helms, E. R., Cronin, J., Storey, A., & Zourdos, M. C. (2016). 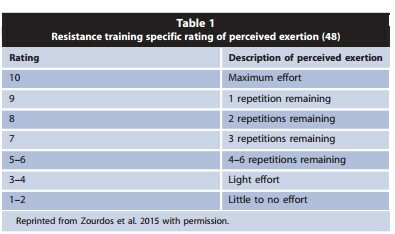 Application of the Repetitions in Reserve-Based Rating of Perceived Exertion Scale for Resistance Training. Strength and Conditioning Journal, 38(4), 42. Helms, E. R., Storey, A., Cross, M. R., Brown, S. R., Lenetsky, S., Ramsay, H., … & Zourdos, M. C. (2016). RPE and Velocity Relationships for the Back Squat, Bench Press, and Deadlift in Powerlifters. Journal of strength and conditioning research. Focht, B. C. (2007). Perceived exertion and training load during self-selected and imposed-intensity resistance exercise in untrained women. The Journal of Strength & Conditioning Research, 21(1), 183-187. Lagally, K. M., Mccaw, S. T., Young, G. T., Medema, H. C., & Thomas, D. Q. (2004). Ratings of perceived exertion and muscle activity during the bench press exercise in recreational and novice lifters. The Journal of Strength & Conditioning Research, 18(2), 359-364. Day, M. L., Mcguigan, M. R., Brice, G., & Foster, C. (2004). Monitoring exercise intensity during resistance training using the session RPE scale. The Journal of Strength & Conditioning Research, 18(2), 353-358.